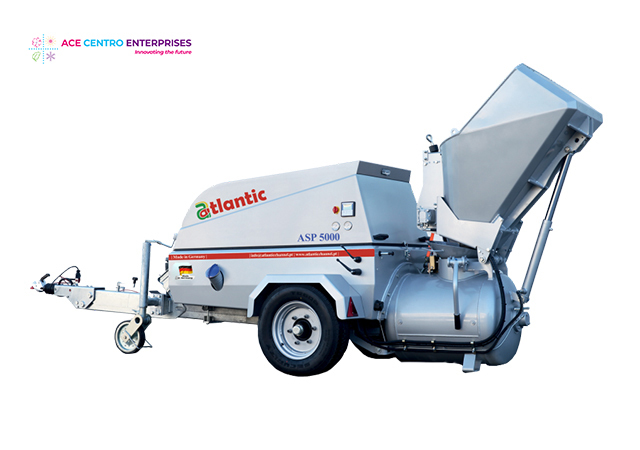 Atlantic Sand/Screed Pump ASP 5000 is a well-designed and user-friendly pneumatic conveyor. It is simple to operate, easy to service and offers productivity of 5 m3/hr. Equipped with an in-built air compressor and a large vessel outlet, the machine is ideal for mixing and conveying sand, floor screed, gravel and fine-grained concrete to higher floors and longer distances. The German engineered diesel hydraulic models come with a powerful Deutz diesel engine and a groundbreaking cooling system. The patented twin hydraulic driven cooling fans are designed for Middle Eastern site conditions. A stainless steel hood displays the robust construction and quality workmanship. The machine features an automatic central lubrication system, a spacious work area for easy and quick maintenance and a fuel tank in steel construction, with filler neck positioned outside. Safety shutdown at the dome sieve. Easy belt replacement of the mixer. Corrosion resistant EPD coated frame. Fuel filler neck positioned outside. Mixing vessel with high-strength wear plates. Fuel tank in steel construction. Sturdy chassis with mechanical overrun brakes. 1.9 ton or 2.5 ton axle as standard equipment. Noise level as per 2000/14/EG guideline.